Seeing the Northern Lights is on just about everyone’s bucket list, but for most of us, making the trek that far north isn’t in the cards. But, what if we told you that you can experience the next best thing just by heading to the Kennedy Center? 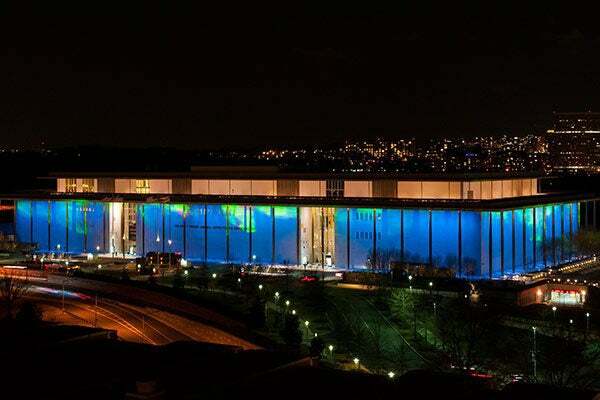 As part of the epic monthlong Nordic Cool festival taking over the District currently, Danish lighting designer Jesper Kongshaug has recreated the aurora borealis on the exterior of the Kennedy Center — and it's nothing short of amazing. Each year, the Kennedy Center chooses a region of the world to highlight through artistic programming, and, in 2013, the focus is on all things Scandinavian — think Denmark, Finland, Iceland, Norway, Sweden, and the territories of Greenland, the the Faroe and Áland Islands. The festival will comprise theater, music, dance, visual arts, literature, architecture, and cuisine in an attempt to show the unity between life, nature, art, and culture. If you’d like to be transported from the District for a fraction of the cost of a plane ticket, look no further — we’ve got the short list of events you shouldn’t miss. All events take place at the John F. Kennedy Center (2700 F Street NW; 800-444-1324) unless otherwise noted. The shimmering light show can be seen on all four sides of the Kennedy Center façade. When: 5:30 to 11 p.m. every night through March 17. This acclaimed production of Kafka's work by Icelandic theater collective Vesturport and the Lyric Hammersmith features a gravity-defying split-level set. When: Today, February 21, through Friday, February 22, at 7:30 p.m. Tickets are $29-$60. Catch a performance by one of Norway’s most fascinating percussionists, who plays instruments carved out of ice. When: Saturday, February 23, time to be announced. Tickets are $25. Swedish folk-pop singer Sofia Talvik makes a stop at the Embassy of Sweden during her extensive U.S. tour. When: Sunday, February 24, at 6 p.m.
Where: Embassy of Sweden, 2900 K Street NW; no phone. Tickets are $10. Based on a true story about a fishing boat that capsizes, this Icelandic film nabbed 11 Edda Awards (the Icelandic equivalent of an Academy Award). Translation? Don't miss it. When: Saturday, March 9, at 9 p.m. Tickets are $8.